Anders Thomsen leads the way for Panthers in heat three against Scunthorpe. Recent Panthers signing Anders Thomsen is out to capture one of the biggest titles in the sport on Saturday. 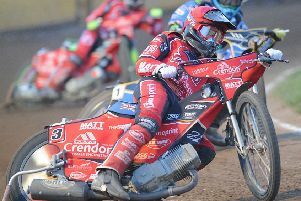 The Danish ace goes into the final round of the World Under 21 Championship in the Czech Republic in third place in the overall standings. He trails leader Bartosz Zmarzlik of Poland by five points, but refuses to give up hope of climbing onto the top step of the rostrum. But Thomsen will also have to defend his current position from two fellow Danes – Mikkel Michelsen and Mikkel Bech – at Pardubice. Thomsen said: “I’m going there to win it as it would be huge for my career. “It is a real shame I snapped a chain in my final ride in the last round otherwise it could have been a lot closer. “But I did pretty well when I went to Pardubice last year and hopefully I can have another good meeting. “I will still need Zmarzlik to have a bad day and I don’t think that will happen as he is a top rider. Thomsen has impressed in his brief Panthers career to date, racking up 33 points in just three outings for the city club. He added: “A lot of people asked me to come to Britain during this year, but the answer was always ‘no’ because I’ve been so busy abroad. “I’ve been racing in Denmark, Sweden, Poland and Germany so didn’t have time for any more meetings. “But the leagues are now finishing on the continent and Peterborough got in touch at the perfect time. “They gave me a good deal and I have good mates in the team so it was an easy choice to sign for them. Emil Grondal also competes in the World Under 21 Championship. He is languishing in 14th place in the overall standings. WORLD UNDER 21 CHAMPIONSHIP STANDINGS: 1 Bartosz Zmarzlik 26, 2 Pawel Przedpelski 22, 3 Anders Thomsen 21, 4 Mikkel Michelsen 20, 5= Mikkel Bech 17, Max Fricke 17, 7 Andzejs Lebedevs 16, 8 Nikolaj Busk Jakobsen 15, 9= Brady Kurtz 14, Victor Palovaara 14, 11 Victor Kulakov 13, 12 Stefan Nielsen 11, 13 Maksym Drabik 10, 14 Emil Grondal 9, 15 Valentin Grobauer 5, 16 Paco Castagna 4, 17 Michael Hartel 3, 18 Nicolas Vicentin 2, 19 Adrian Cyfer 1.